Collaborative Conflict Resolution is a highly interactive and engaging one-day workshop designed for all levels in the organization. Participants learn the value of conflict, and are equipped with the skills to manage their own conflict situations constructively. Included are a Conflict Styles Assessment, skills for managing emotions, and a skill practice using proven steps for resolving conflict collaboratively. A follow-up day of review, practice, reinforcement and extended skill building is strongly recommended. Collaborative Conflict Resolution presents a context for understanding the value of conflict. It provides insight into one’s own preferred Conflict Style and the implications it has in conflict situations, as well as addressing how to work with others’ styles effectively. Introduction to Collaborative Conflict Resolution: Participants gain clear understanding of the value or positive outcomes of conflict, along with its potential negative consequences if left unattended. Introduces the concept of conflict styles; a person’s preferred way of dealing with the conflict situations. Participants take a self-administered assessment that reveals their dominant and less preferred conflict styles. The five conflict styles are discussed and evaluated for their positive and negative aspects in various conflict situations. 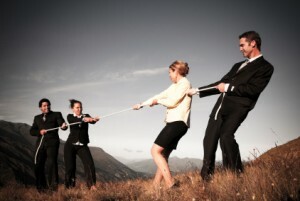 Practical tips for dealing with other conflict styles are provided. Participants learn the value of finding solutions to conflict which fully satisfy the concerns of both persons. They learn and experience the role of emotions and self-management during conflict. They discover a protocol of communication ground rules that facilitate Collaborative Conflict Resolution, and a process within which to apply them. Skill Practice/Role Play: Participants identify a real conflict situation they want to work on. They partner with two participants and take turns applying the tools and steps of Collaborative Conflict Resolution in respective role plays, giving and receiving feedback.